A little brown bird in sub-Saharan Africa known as the greater honeyguide is known to cooperate with humans to locate honey-rich bees’ nests. The bird calls out to honey hunters and then leads them to the nests. Now there is evidence that the communication goes both ways. In a new paper published today in Science, South African researchers report that the birds seem to recognize and respond to human calls in turn. We’ve known about this unique partnership for hundred of years, according to lead author Claire Spottiswoode of the University of Cambridge and the University of Cape Town. In 1588, a Portuguese missionary in what is now Mozambique named João dos Santos wrote about spotting a small brown bird nibbling on on the beeswax candles in his church. He also noted how the bird called to men and led them to bees’ nests by flying from tree to tree. Then the men would harvest the honey, and the bird would feast on the wax left behind. Spottiswoode recalls being “electrified” as an 11-year-old girl in Cape Town when she heard Kenyan naturalist and ethnobiologist Hussein Isack speak about this unusual behavior of honeyguide birds. He found that humans could significantly increase their chances of finding bees’ nest if they followed the little brown birds. 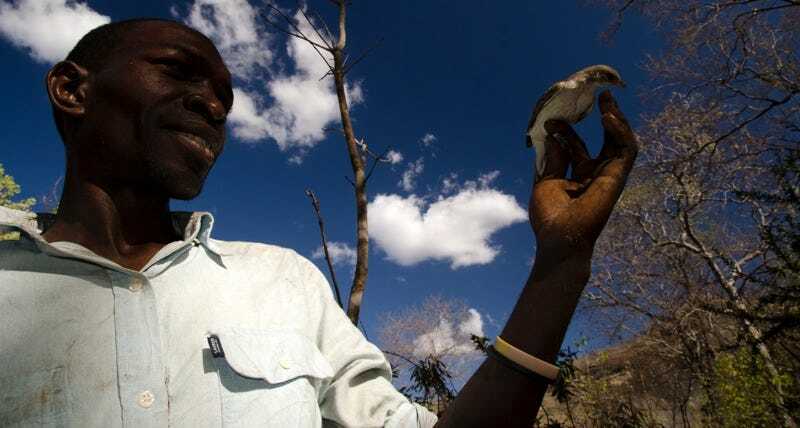 For the honeyguides, it’s a win-win partnership: the birds help the humans find the nests, while humans do the work of subduing the bees and cracking open the hive, so the birds can avoid being stung. The humans get to collect all that sweet, sweet honey, while the honeyguide birds gorge themselves on the tasty beeswax left behind. She wanted to find out if this really was an example of two-way interspecies communication. She and her coauthors—conservationists Keith and Colleen Begg of the Niassa Carnivore Project—interviewed 20 Yao men, all of whom learned the bird calls from their fathers. All insisted it was the best way to attract the birds. They also followed the honey hunters on their searches, and found that 75 percent of the time, the birds led the men to bees’ nests. Spottiswoode made recordings of the hunters’ calls, along with two control sounds: hunters calling out arbitrary words, and the bird calls of other species. Then she walked with two honey hunters, playing one of three types of acoustic cues every 7 seconds over 15 minute intervals. Yassene chops open a bees’ nest in a felled tree in the Niassa National Reserve, Mozambique. The results: using the specific honeyguide call increased the probability of attracting the aid of a honeyguide from 33 percent to 66 percent, compared to the control sounds. And using the “brrr-hm” call more than tripled the likelihood of finding a bees’ nest, from 16 percent to 54 percent. Spottiswoode points out that Hazda honey-hunters in Tanzania use a different sound—a melodious whistle—to attract the honeyguide birds. “We’d love to know whether honeyguides have learnt this language-like variation in human signals across Africa, allowing them to recognize good collaborators among the local people living alongside them,” she said.